My little boy Jacob had such fine hair when he was born and had hardly any hair until fairly recently, it suddenly just grew and was getting really long around his ears and we knew it was time to take him for his haircut. Last year we visited Pikku, located on Gosforth high street for the first time to get Sophia's haircut. We were so impressed that we have never gone anywhere else since and she regular enjoys visiting to get her crazy curls cut. 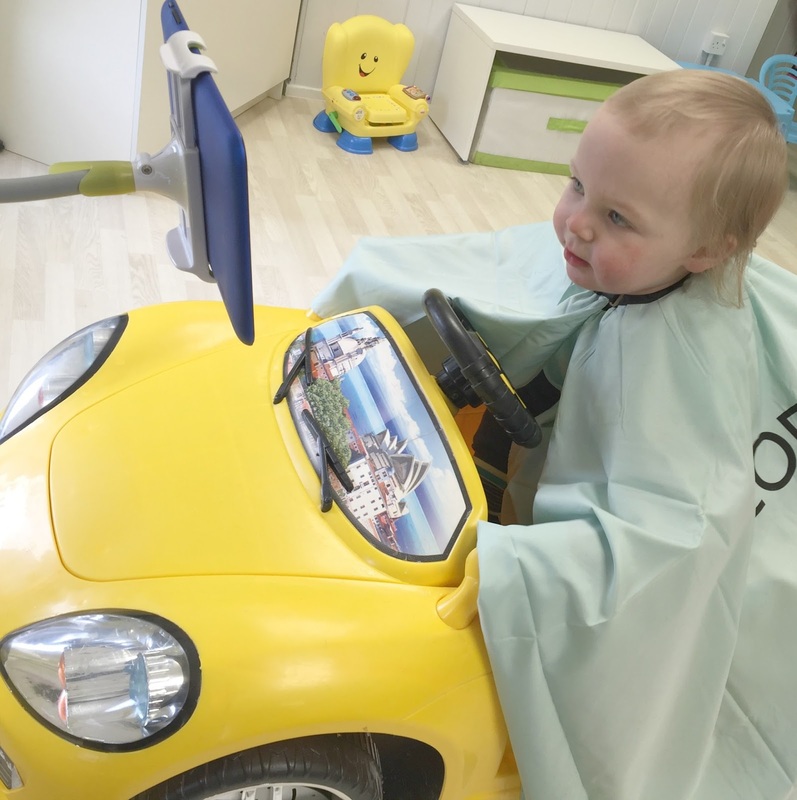 So when the lovely people at Pikku heard that Jacob was in need of a trim they booked him in for a special Baby's first haircut session. Even though I know first hand how lovely the staff and salon are I was really nervous about taking him, he has just turned 18 months and he is at the age where he won't sit still. He also really does not like his neck or ears being touched. He was booked in with Trish who is super lovely and friendly and cut Sophia's hair on her first visit. 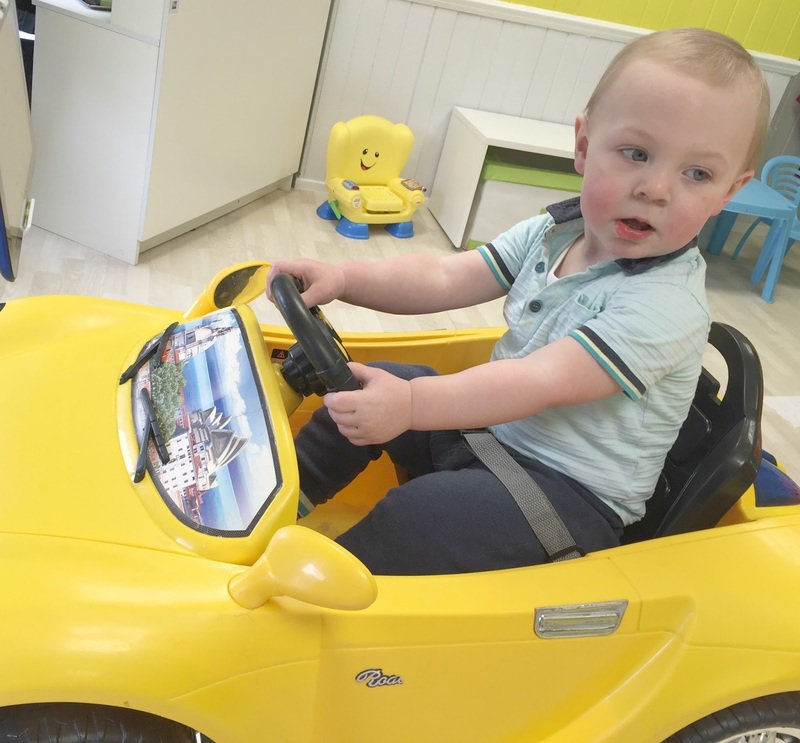 Trish instantly made Jacob feel at ease by chatting to him and putting some nursery rhymes on the iPad that is attached to the front of the car, to help distract little ones while they get their haircut. Yes, Jacob did wriggle about but all the stylist are well trained and are used to children doing this so they know exactly what they are doing and have great techniques to distract little ones which enables them to quickly cut their hair. The cut was over in no time and I was so impressed, as just by having the wispy bits of baby hair cut off Jacob looked so grown up and had a proper little boys hairstyle. As it was his first haircut they also kept a lock of his baby curls which were put in a little pouch and he also received a certificate, which will be a nice keepsake. He was also giving a balloon and some magic bubble that all children receive when they leave the salon, I think this is such a lovely touch and makes the whole experience that little bit more special for little ones. We really do love Pikku and we won't take our children anywhere else, we recommend it to everyone that we know. It was the perfect place to take a baby or toddler for their very first haircut as the staff are all friendly and patient, the salon is really bright and appealing to children, the car chairs they sit in to get their haircut are very fun and the whole experience is just so lovely and enjoyable for parents and children. To make things easy for us parents you can even book your child's haircuts online at www.pikku.co.uk which is quick and easy to do. Fluffy baby hair tidy ups cost from £7.50 and cut and styles for 1-5-year-olds cost £12.50. Full prices and services provided are on the Pikku website, as well as the gorgeous clothes they stock in their boutique situated below the salon. * Disclosure: We received this haircut free of charge in return for this review, however, all words and opinions are my own. Aww! It sounds such a child friendly place.